Hello there… how is Monday treating you? Are you having the Monday Morning Blues? If yes I have the perfect trick to vanish that blue and get in some red! Yes I have my favourite cup cake today for my R post. It’s the Red Velvet Cup Cakes. I so love cup cakes and they are so easy to bake. I tend to avoid a lot of frosting in my cup cakes and like a rustic basic cup cake. 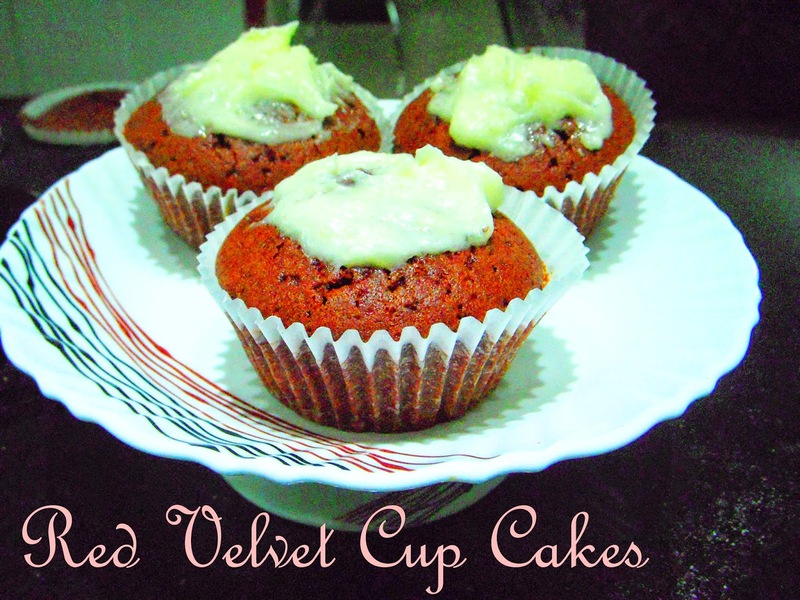 But somehow I love the red velvet cup cakes because of its distinct flavor and color of course. In my recipe I have kept it very easy and basic and have done 3 with a cream cheese frosting and left the rest without frosting. This recipe makes 6 cup cakes. Its super easy actually you need to mix all dry ingredients and wet ingredients separately and then mix them together. In another bowl mix butter, eggs, oil, butter milk, vanilla essence and food coloring. You will find it has a bright red color. It will deepen further as you bake them. Pour in the batter with ice cream scoops. Now bake in a preheated oven at 180 degrees C or 356 degrees F for 15 minutes or till a tooth pick inserted comes out clean. Tip: How Will you know your cup cake is baked? When you place your finger on top it should be like spring action and your finger shouldn’t sink in or you shouldn’t get batter on your finger. It means it still requires little more baking time. Take butter and cream cheese in room temperature in a mixing bowl and mix together with a spatula. How to do the frosting? Don’t start frosting on cupcakes which are just out from the oven, the cheese will melt. Let the cupcakes cool down on a wire rack for 15 minutes. You can pour the frosting in a piping bag and then swirl over the cup cakes, or use the back of a spoon or a butter knife. I did it with a spoon because I made very little frosting and I was too lazy. I made it last evening for dinner, and we almost had the desserts first and then our dinner! So there you go your Red Velvet Cup Cakes are ready. The last two pictures are clicked under light so you can see the bright red color better. Linking this post to A to Z Challenge 2014 for Day #18 – post starting with R.
I had my first red velvet cupcake a few months ago, and now I am hooked.